One of my early attempts to build a Lego printer. The print head here is driven by a rack and pinion. Later versions used a technic tread and sprocket. In June and July, I borrowed the girls’ robotics team Lego pieces and EV3 brain in order to build my own dot-matrix printer. At various FIRST events, I have seen a kid or two who built a printer. I’ve also seen some on YouTube. As a fan of retrocomputing and Legos, I thought it would be a lot of fun to make my own printer. The basic idea is simple and requires three motors. One feeds the paper forward or backward. One slides a print head back and forth horizontally across the page. The last one moves a marker or a pen up and down to draw a dot. I made a lot of iterations of this printer, trying to solve various problems. It wasn’t perfect, and I was particularly limited by the number and kinds of pieces I had available. But it DID work! I was able to print out some portraits that were recognizable, as well as a Print Shop-style banner. 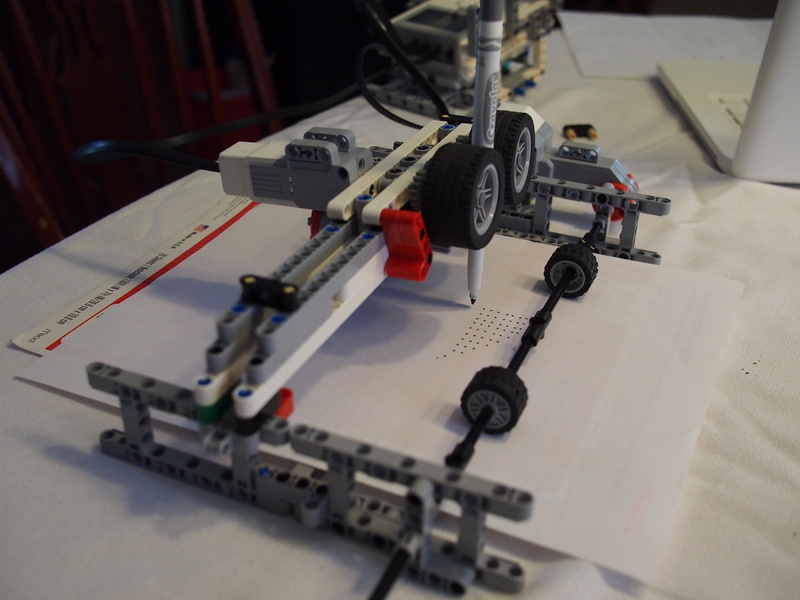 Lego printer for Fathers Day from Josh Renaud on Vimeo. 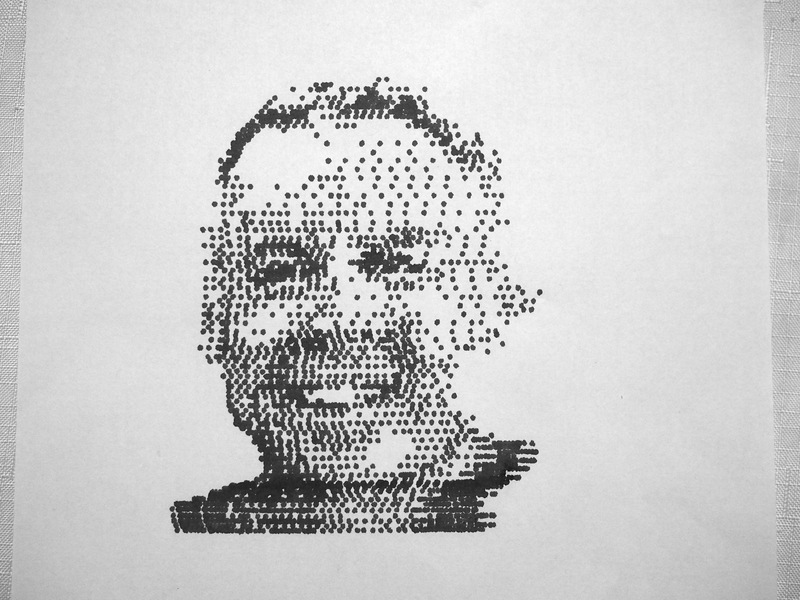 This is a simple dot-matrix portrait of my dad made using an early version of my Lego printer. The right side gets distorted, but the left and center are pretty good. The main challenges (for me, anyway), were how to move the marker up and down, and how to code the printer so that it had good resolution. Early on, I attached the motors directly to the shafts, then measured how far to move things using tacho counts. But that led to very sloppy, inconsistent results. After a while, I realized I needed to use a technique called “gearing up”: The motor turns a small gear, which then drives a much larger gear. This decreases speed, requiring me to use many more tacho units to move the print head the same amount. On the surface this might sound bad, but in fact it greatly reduced inconsistency. I used “gearing up” to improve both the paper feeder, and the horizontal print head movement. You can even use acrylic photo blocks for printing and showcasing colored images as they last for years and are moisture proof thus ensuring no damage to the picture. I wrote the code for the printer in Python, and controlled the EV3 using the ev3dev linux system. Later versions of the code were capable of reading in a PNG file and converting it to a low-res black and white image to print. At the end of the summer, I created a 3D model of the printer using Lego Digital Designer. Download the viper-printer.lxf file and try it yourself in either LDD or Stud.io. The model isn’t perfect (There are two blank slots in the tread where I couldn’t get things to connect, for example), but is a nearly exact replica. Jadzia shows off our robot at the Missouri State Capitol. 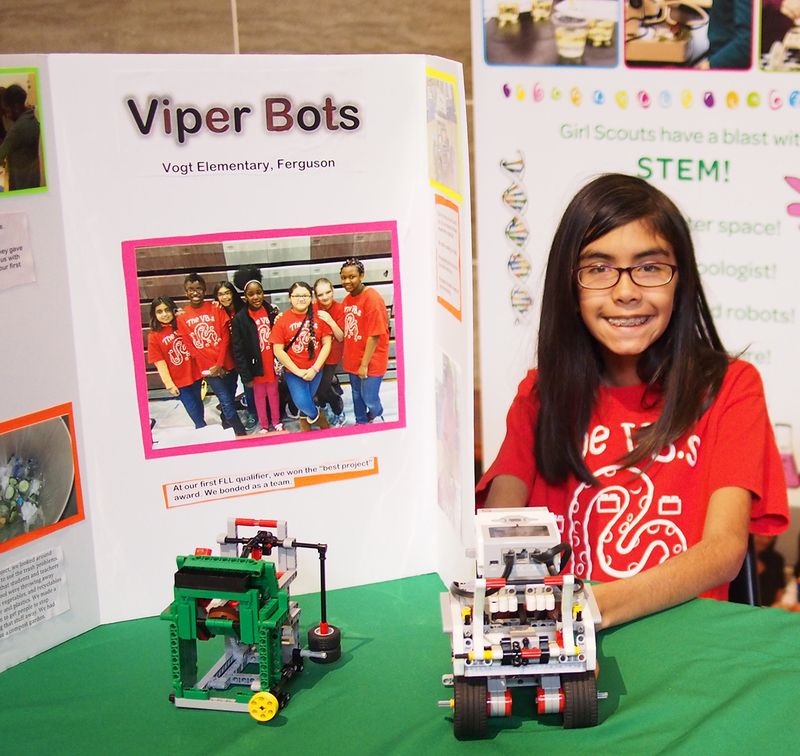 On March 3, Jadzia and her Viper Bots teammates joined the Girl Scouts of Eastern Missouri for a STEM expo at the Missouri State Capitol in Jefferson City. 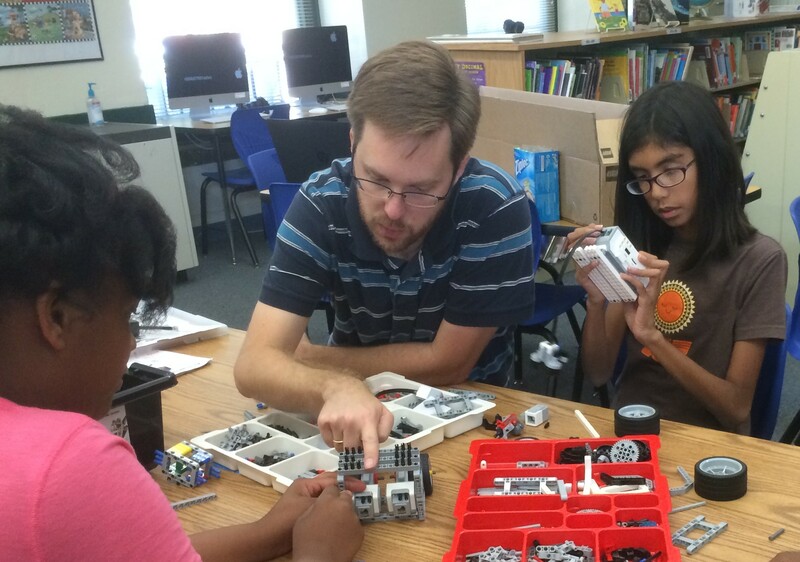 This year, our elementary school introduced a new Girl Scouts robotics team. I was asked if I might like to help out. I like programming and Legos, so I thought it sounded like it could be fun. 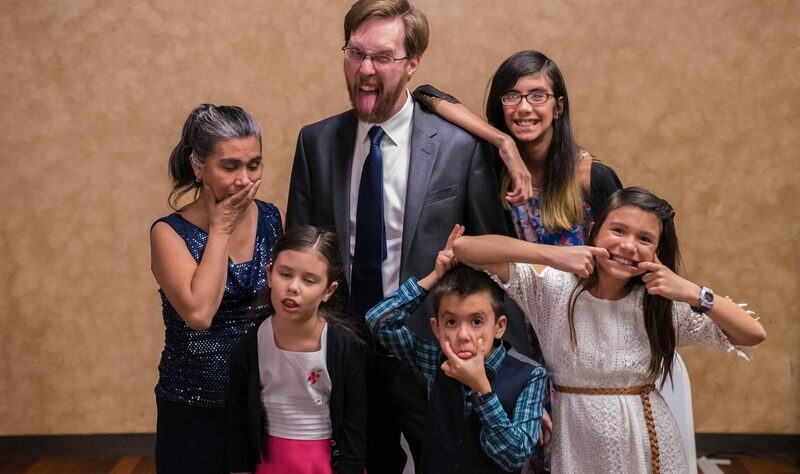 I didn’t realize I would end up being the team’s coach. Before long I was receiving boxes from Lego in the mail.